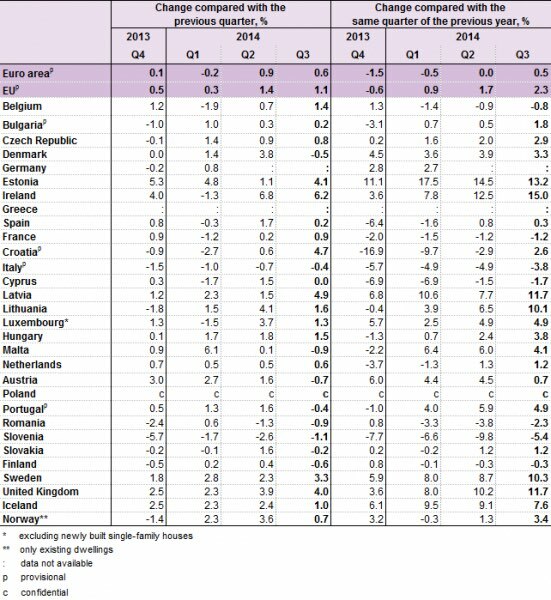 Spanish house prices increased an annualised 0.3% in the third quarter of 2014, compared to 2.3% in the European Union, and 0.5% in the Eurozone, all according to the Eurostat House Price Index published in January. For the second quarter in a row Spanish house prices were up on an annualised basis, after many years of contraction. For once Spain is not amongst the countries where house prices fell the most. That distinction goes to Slovenia (-5.4%), Italy (-3.8%), and Romania (-2.3%). At the other end of the scale, prices rose the most in Ireland (+15%), Estonia (+13.2%), and the UK (+11.7%).